Dylan Jones, Bolton & Menk, Inc.
Visioning committee meets at 4pm to plan March 18 workshop. Groups of residents will be recruited to give ideas on ways to improve transportation enhancements for Humboldt. We meet at ISU Extension and Outreach. 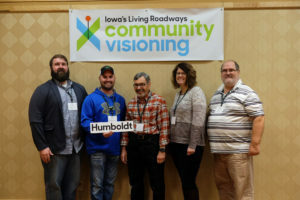 Members of the Steering Committee for Humboldt’s Community Visioning Program attend Kickoff in Ames. Members Travis Goedken, Clayton Vorland, Kirk Whittlesey, Jess Poutre, and Bret Davis attended the Kickoff event celebrating the 20th year of the Living Roadways program.